Seven cyclists set off from Rippleside Park. While the gender balance wasn’t 50/50, at least there were two girls – Karen and Helen. Shane, David F, Barry, Mike C and Doug made up the peloton. After a gentle climb up Church Street to McCurdy’s Road, the riders swept down Highland Street to Fyansford and followed the Hamilton Highway west to Pollocksford Road. The weather was cool and the winds south westerly. It was good to see that a large, wheel-eating pothole on Pollocksford Road has finally been repaired. As ride leader Helen approached the bridge over the Barwon River, she was very concerned to see Barry about to cross with a vehicle coming the other way. This is a reminder to leaders to give warning of known hazards. Luckily, prudence on Barry’s part averted a potential risky clash. The long ascent to Barrabool Road is one of the best in the district. There are two short sharp steep sections, a long gentle ascent between an avenue of trees and a final push to the top after the road turns south. The riders regrouped at Barrabool Road for a photo. 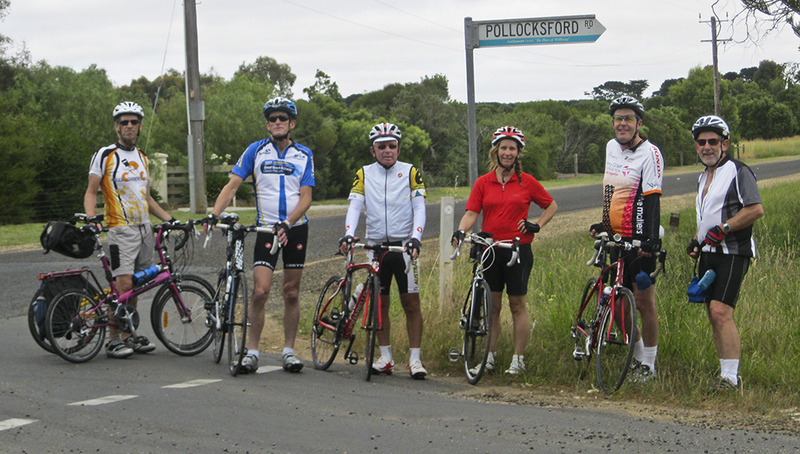 Shane, Mike, Barry, Karen, David, Doug at intersection of Pollocksford and Barrabool Roads. After turning west along Barrabool Road the cyclists continued to its end at the Princes Highway before crossing over and continuing south on Considines and Church Roads. The intersection of Larcombes Road marked the furthest outward point. Turning back to the east the riders followed quiet roads to Anglesea Road, and a coffee stop at the ultra-popular Freshwater Creek Cake Shop. The route back to Geelong followed more quiet roads – Dickens Road, Ghazeepore Road, a short section on the Waurn Ponds Creek bike path, and then into Highton and Belmont before crossing the Barwon on the MacIntyre Footbridge. The river path to Swanston Stret was very quiet after Saturday’s congestion. The circuit concluded with the cyclists riding up Swanston Street (not temped to a second stop at the newly opened Little Creatures Brewery) and along the waterfront. By this stage the gender balance had changed considerably – with only the two girls left. The whole circuit was 75km, the roads (apart from two short sections along bike lanes on highways) very quiet, and there was, like all good ‘lazy cyclist’ rides, a tail wind to help push the riders home. Highland Street – steep fast downhill – The top few hundred metres of the road is now quite corrugated. Lack of sealed shoulder on Hamilton from Fyansford to the Geelong Ring Road flyover. Crossing of Princes Highway – short unsealed section during works to duplicate the road. Fast traffic – care required while making the crossing. Care needed crossing Cape Otway Road (fast traffic). This entry was posted in Hazards, Organised bike rides, Rides in the Geelong Area, Uncategorized by hlyth2013. Bookmark the permalink.